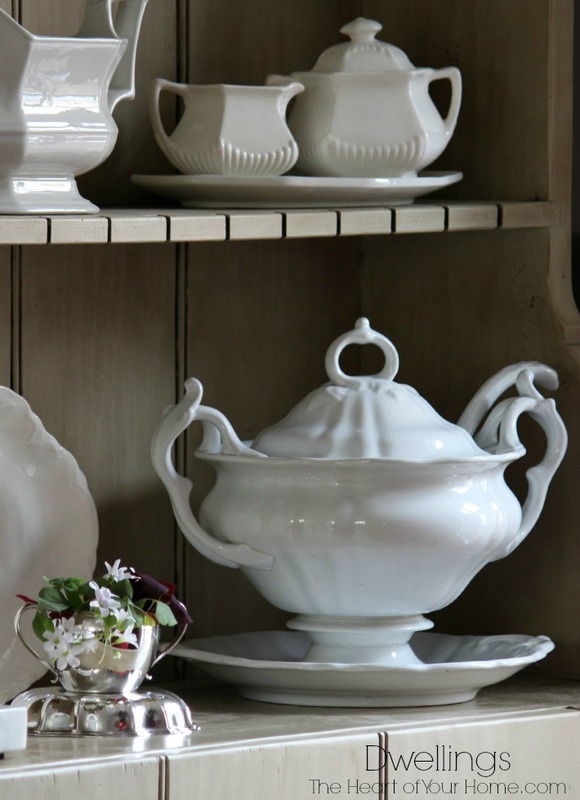 Ironstone ~ It Never Hurts to Ask! One of my favorite places to look for antiques is a little shop just down the road. For a good while now I've had my eye on the one and only ironstone piece in the shop, a soup tureen. Way out of my reach, I couldn't pay the price they were asking. For months I've kept my eye on it and from time to time I would stop in to see if it was still there and if by chance the price had been reduced, but no luck. Last week I stopped in again. It was still there with the same price so I finally asked about it. Giving an amount I was able to pay, and hoping they would agree, they did! I enjoy looking into the history of antiques. Using the markings I was able to find that it was made by P. Regout Maastricht in 1882. I couldn't believe the condition it was in. There is a good bit of crazing which I think adds to it. On the cupboard in the keeping room my ironstone collection is slowly growing. I can't wait to use this piece, it will have something to do with Spring! a good day for a nap which Coco is taking advantage of! Do you sometimes ask for a better deal? For great features and inspiration hop on over for Amaze Me Monday! What a beautiful piece! The shape of the handles is just wonderful. The last picture with your kitty snoozing is so sweet. I'm too chicken to ask for a better price usually. 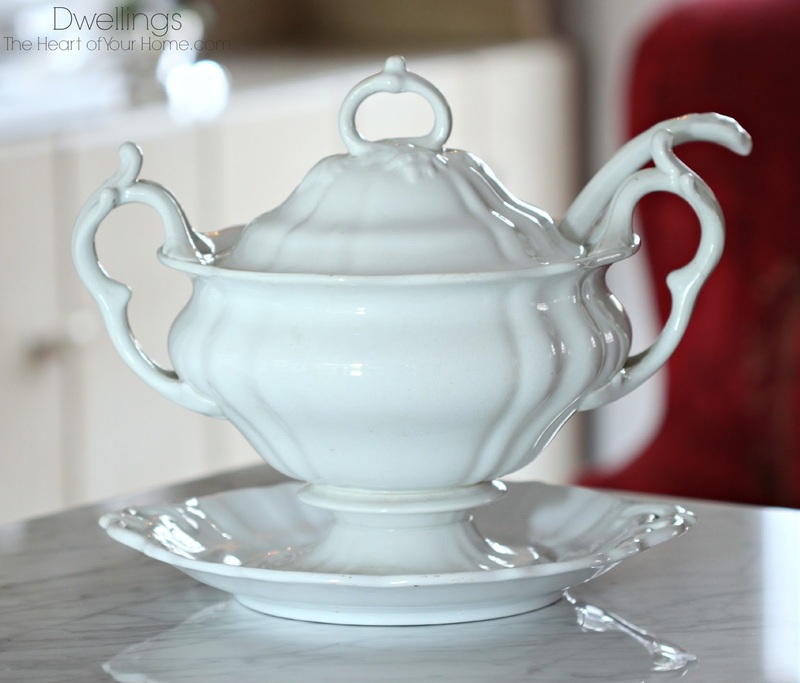 Hi Cindy, you have a wonderful, complete tureen! I love the crazing, and even the brown discoloration. It's always nice to find maker's marks and learn about pieces acquired. Your hutch is looking beautiful, esp. with the floor, the marble and red chair with it. Yes, I ask for deals, and I think most dealers expect it, as much as 15-20%, depending on the amount you're spending with that one dealer. What a beauty Cindy! I always negotiate and it usually pays off! That is lovely! When I shopped in the past, if the price wasn't in my range, I just kept on walking. I don't shop anymore. I *always* ask for a better deal in any unique mom and pop kind of place - which is about all I give my money to these days. 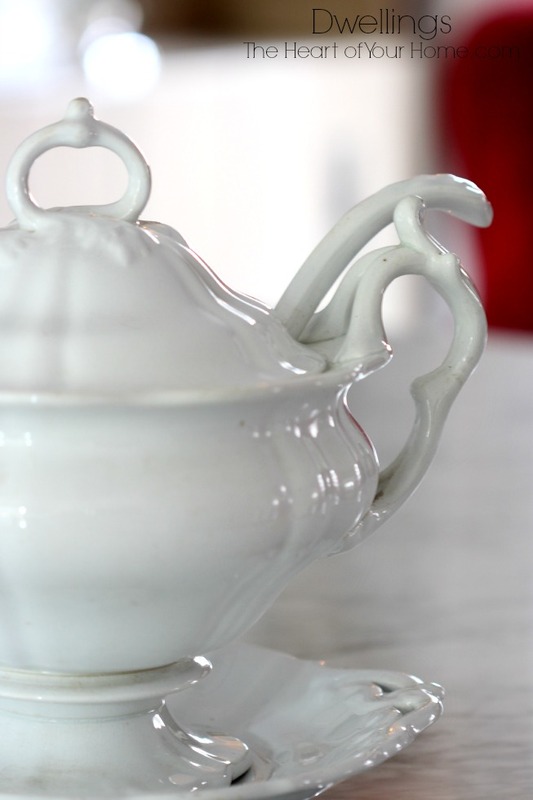 I LOVE your tureen, one of the most beautiful I have ever laid eyes on. Well done, ma'am! So glad you asked!! 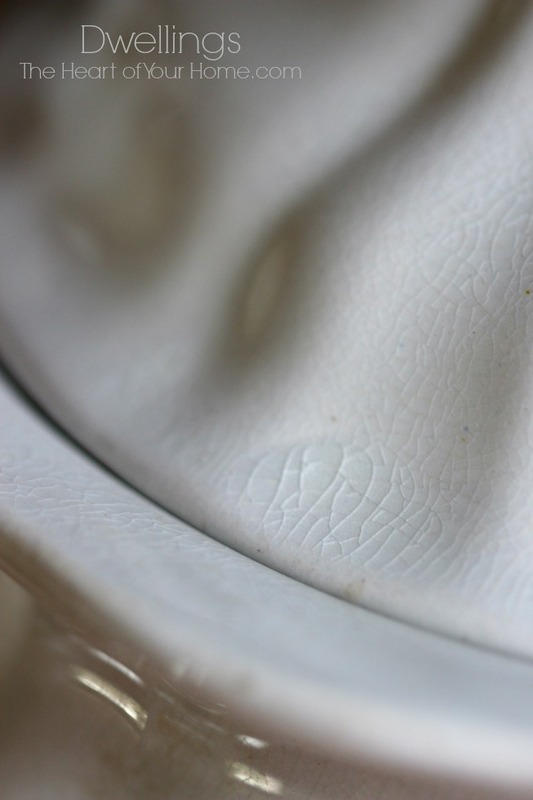 You found a great piece with pretty details. As antique dealer, I hate to price my merchandise because I need to mark it up for the customers that ask for a discount, so I really don't think that it's fair for the people that don't ask for a discount. When it's time to move something out, then I will put it on sale. I think antique shops should be just like any home décor or gift shops, I really don't know who thought that it was a good idea to give discounts, that doesn't happen in any other type of retail store, so why in world should it happen in our shops? I had a shop for many years and always priced to make a fair amount based on what I had in the piece. Vendors offered 20% to each other, we were willing to make a little less for vendor to vendor sales. I always thought one of the great things about this type of business was the option to change the price if a customer asked and I wanted to. Sometimes the item had been there longer than I wanted and it was good for me to give a markdown to get it sold, it being my decision to do so and also I decided how much to discount. It was fun, sometimes I miss having a shop. Gorgeous piece! Looks so pretty in your hutch. I too, love the crazing on pieces. I always do especially if the price is steep and rarely do I not get the item for the price I want! :-) Glad you asked on this one, it is a real beauty Cindy! Oh, that is a gorgeous piece, Cindy! I most always ask if that's their best price. And you're right, they usually will come down. I love the look you have going on in your hutch! You have so many pretty pieces and your home is beautiful. I often ask for a better price. What's the worst that will happen? They'll just say no. I love this piece, congratulations! What a find! It's a great piece. Aren't you glad you asked. It's a beautiful piece. No, it never hurts to ask. 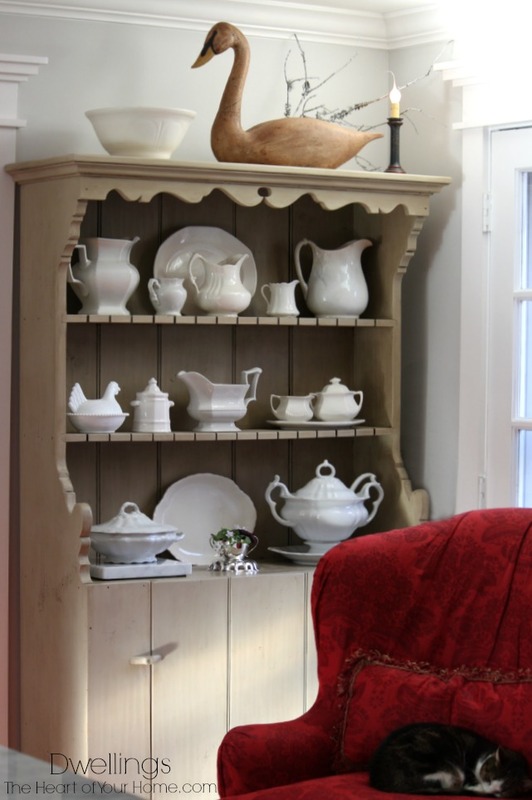 That is a gorgeous piece and looks so nice in your cupboard! I collect it too!! 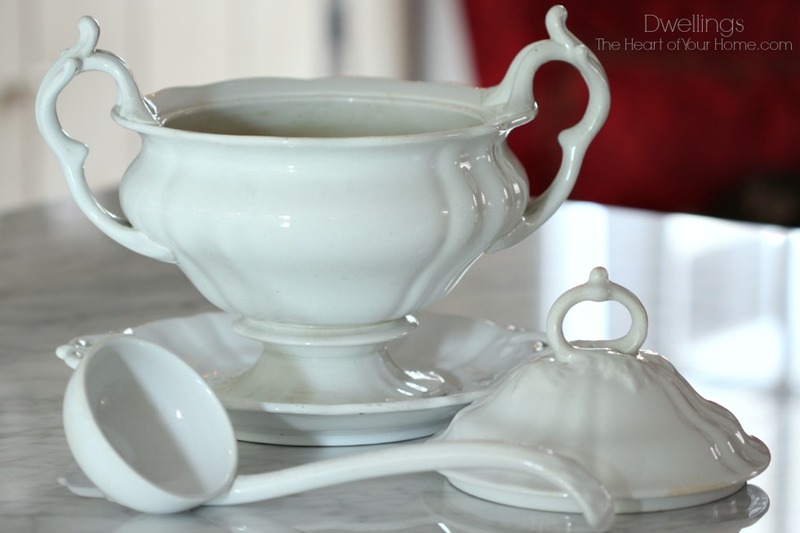 Amazing ironstone soup tureen, dear friend!!! I'm not one to ask if there is room ofr negotating, but "Mr. Ed" does! I agree, it never hurts to ask! 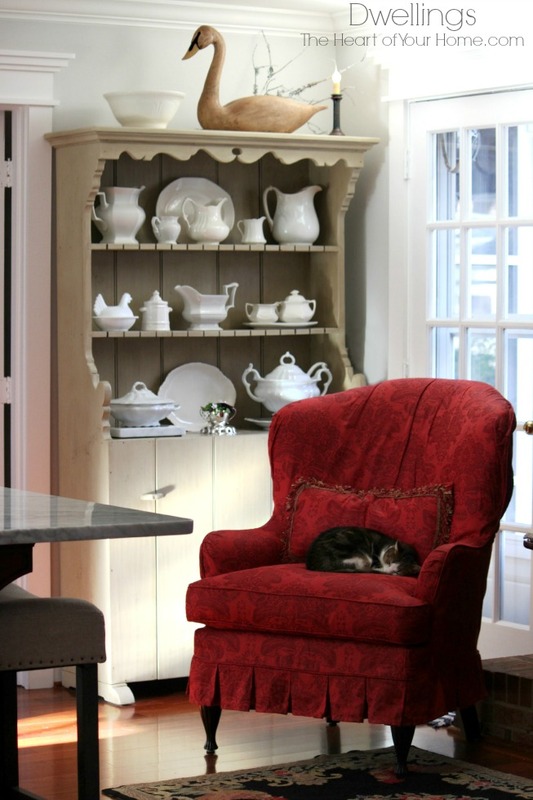 Adorable photo of Coco 'cat napping' in the chair!!! It's beautiful and I'm glad you were finally able to get it.